Get the EZ DOH bread dough maker in white. 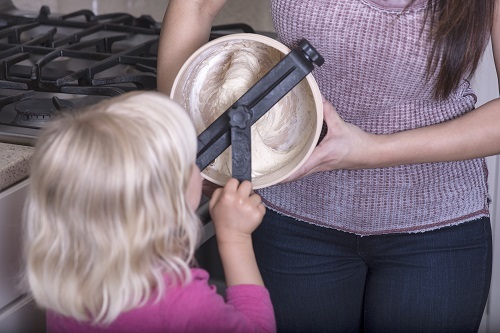 The EZ DOH manual bread dough mixer is a simpler, less expensive, and more enjoyable way to make delicious homemade bread. Just put the ingredients into EZ DOH's bucket, secure the hand crank, and in less than 5 minutes you'll have perfectly-mixed dough. Easy clean-up with soap and water. Includes two coupons for Red Star Platinum yeast and a recipe book insert with lots of delicious ways to vary our Basic Recipe. EZ DOH is easy to use - all mixing, kneading and rising is done in the EZ DOH bucket. Because it uses no electricity and has no sharp blades, EZ DOH can be used by anybody, regardless of age or ability. Here were my first impressions after using the EZ DOH for the first time: Pros: - Bucket is small enough to handle - Basic dough Ingredient list is printed on the outside of the bucket - Plastic bucket does need preheating like a stainless steel bucket to prevent heat loss to your luke warm water to get the yeast started Con's: - Cross bar is secured with knob-screws. A spring loaded-knob would make assembly easier - This might be operator error, but a single EZ recipe seemed to spin around the bucket instead of being kneaded by the paddle bar. A larger recipe batch might not have this same problem since it should make contact with the sides as well as the bottom of the bucket creating more friction with the paddle bar.